4.8.6.10 This Schedule applies to FIRST CLASS cities and code cities with population over 20,000 (RCW 35.01.010, RCW 35A.01.035, RCW 35A.40.210). The purpose of this Schedule is to document compliance with limitations on public works projects performed by public employees as described in RCW 35.22.620(2)(4). 1. 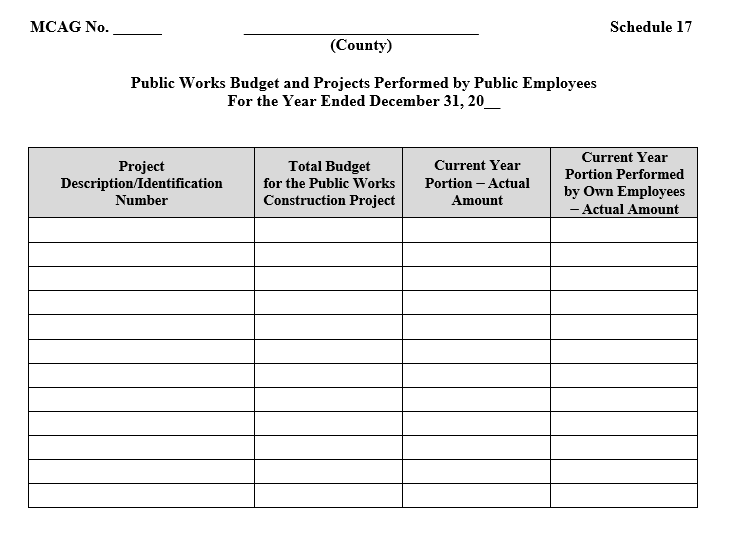 Record the total current public work construction budget, including any amendments. 2. Record the limitation on public works projects performed by public employees. RCW 35.22.620(2) sets this limitation at 10 percent of line 1. 3. Subtract the amount, if any, that was in excess of the permitted amount in the prior budget period. 4. 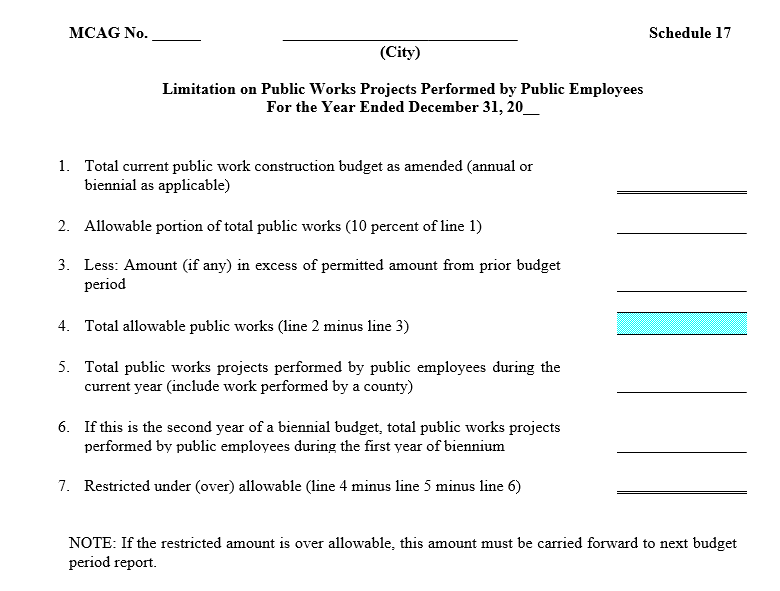 Record the limitation on public works performed by public employees for the current year (line 2 less line 3). 5. Record the total construction costs of public works performed by public employees for the year being reported. Be sure to include work performed for the city by a county. 6. This line is only pertinent to cities that budget on a biennial basis. For those municipalities, record on this line total construction costs of public works performed by public employees for the first year of biennium. 7. 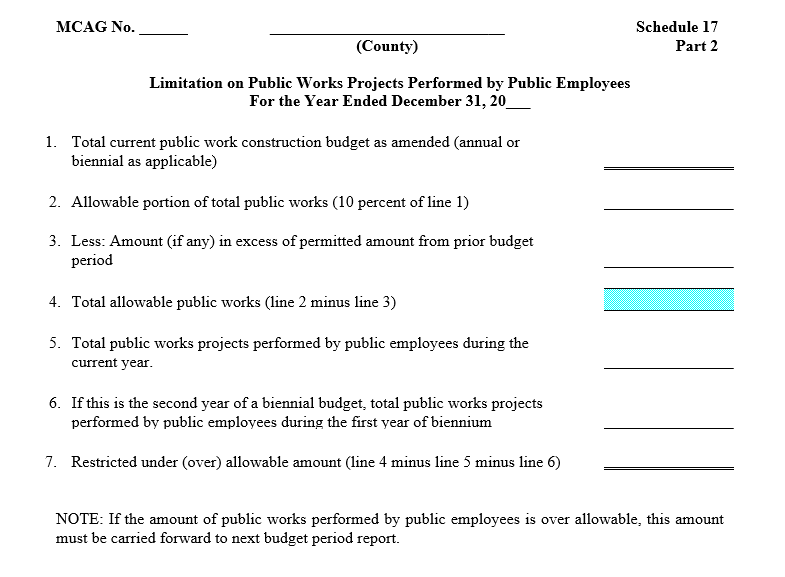 Record the difference between the statutory limit computed on line 4 and the amount of public works performed by public employees recorded on lines 5 and 6. A negative number here indicates noncompliance with the limitations and must be carried forward to next budget period report. If this noncompliance is not corrected within two years, 20 percent of the motor vehicle fuel tax will be withheld (RCW 35.22.620(2)). 4.8.6.11 The Schedule should be prepared on the same basis of accounting, for the same period and reporting entity, and using the same underlying accounting records as the Schedule 1 and financial statements. 4.8.6.15 The template for Online Filing is available on the SAO’s website page at BARS Reporting Templates. The following is an example of the Schedule. 4.8.6.20 This part applies to counties with population of 400,000 and more that established purchasing departments and use public employees to perform public works projects (RCW 36.32.240(1), RCW 36.32.235). 4.8.6.30 For reporting county road construction projects, the counties can submit the Annual Construction Program and the Annual Construction Report forms, required by the County Road Administration Board, pertaining to the same calendar year. Access to blank forms is at www.crab.wa.gov. 4.8.6.40 REMINDER: Counties with population under 400,000 that establish purchasing departments do not have statutory authority to use their own employees for public works (RCW 36.32.240(2)). No statute addresses limitations for counties under 400,000 that do not have a purchasing department. ALL counties are subject to limits for the county roads construction projects (RCW 36.77.065). See Part 3 of this Schedule for reporting requirements. 4.8.6.50 This part applies only to counties with population of 400,000 or more which by resolution established a county purchasing department (RCW 36.32.235(8)). The calculation excludes county roads construction limits, which are reported in Part 3 of this Schedule. Line 1. Record the total current public work construction budget, including any amendments. Line 2. Record the allowable portion of public projects performed by public employees. RCW 36.32.235(8) sets this limitation at 10 percent of line 1. Line 3. Subtract the amount, if any, that was in excess of the permitted amount in the prior budget period. Line 4. Record the limitation on public works performed by public employees for the current year (line 2 less line 3). Line 5. Record the total construction costs of public works performed by public employees for the year being reported. Line 6. This line is only pertinent to counties that budget on a biennial basis. For those counties, record on this line total construction costs of public works performed by public employees for the first year of biennium. Line 7. Record the difference between the statutory limit computed on line 4 and the amount of public works performed by public employees recorded on lines 5 and 6. A negative number here indicates noncompliance with the limitations and must be carried forward to next budget period report. If this noncompliance is not corrected within two years, 10 percent of the motor vehicle fuel tax will be withheld (RCW 36.32.235(9)). 4.8.6.60 This part applies to ALL counties (RCW 36.77.065). The counties are required to prepare and have available for an audit the Annual Construction Program and the Annual Construction Report forms, required by the County Road Administration Board, pertaining to the same calendar year. Access to blank forms is at www.crab.wa.gov.